In 1977 the manuscript of Carcere e fabbrica: alle origini del sistema penitenziario was published in Italian (Melossi and Pavarini 1977). We are therefore publishing this new edition in English exactly 40 years since the original publication. Essentially the book consisted of a review of historical material about the origins of imprisonment, informed by a Marxist vision. 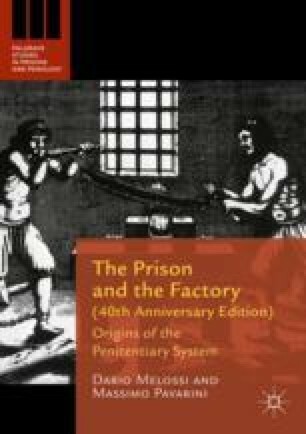 This was also its claim to originality in the sense that, by applying a Marxist reading to prison history materials, it appeared clearly that the very origin, the very “invention” of the prison, is tightly linked to what Marx, in the first volume of Capital, calls “original” or “primitive” accumulation. Not only this but, in the centuries that followed, the very logic of primitive accumulation would be reproduced and expanded through the incessant conquest and colonization of pre-capitalist areas of society, not only, obviously, in its capitalist matrix, but also in the penal system, by virtue of the crucial requirement of “discipline” (I shall expand on this later on). Notwithstanding, the book has often been read as if it had been a story about the invention of the prison as some kind of “school” (a “professional training school” perhaps?) for an apprentice working class—confusing our thesis, I surmise, with penological visions on rehabilitation/resocialisation/re-education (as Italians call it) by means of work. Hence, there were lots of instances in which critics were only too happy to show that this was not indeed the case. Even if, at times, prisons might indeed have looked a bit like such schools or vocational institutes, this is certainly not what we meant. Through the following very synthetic reconstruction of the genesis of the book, as well as of some of its aftermath, I will try to show why I have always been quite unhappy with such a (wrong) reading. I thank my good friends Maximo Sozzo and José A. Brandariz-Garcia for all the feedback and exchanges that took place when I presented the main ideas for what follows, within lectures given at the Winter School in Criminology of the Faculty of Legal and Social Sciences, Universidad Nacional del Litoral, Santa Fe, Argentina (July 2014) and at two International Conferences organized at the University of A Coruna, Spain, in September 2014 and September 2016. I am particularly grateful to Maximo Sozzo and Alessandro De Giorgi for their comments on a previous version of this chapter (usual disclaimers apply). I also thank the Center for the Study of Law and Society of the University of California, Berkeley, for having provided me once more with the ideal physical and intellectual space during the completion of this work!